The snake must have been living there for some time, the homeowner said. camera (Courtesy Mark Lampart) Englewood, Florida resident Mark Lampart, 19, and his girlfriend, Kyleigh Wofford, 18, work together to remove snakes in the area. A Florida family discovered a 6-foot boa constrictor in their home after hearing noises from their attic for years. Englewood resident Bob van der Herchen, 75, said it's "anybody's guess" on how long he and his wife had been sharing their home with the massive reptile, but they had been hearing noises coming from the space above their ceiling for about two years. "From time to time, we would hear noises in the attic," van der Herchen, who owns a bee removal and rescue company, told ABC News. "I wasn't really sure what they were." Van der Herchen said they first made the revelation on July 17 when his son said he suspected the culprit of the errant noises was a snake. He then saw the snake through an opening in the utility room's ceiling, van der Herchen said, but by the time he'd gotten there, it had disappeared. He assumed it was just a rat snake, a garden snake common to Florida. "Well, we don't have to worry about any rats up there," he said he thought to himself. A few days later, van der Herchen caught a glimpse of about a 6-inch portion of the boa and thought to himself, "Wow, that's really big," he said. 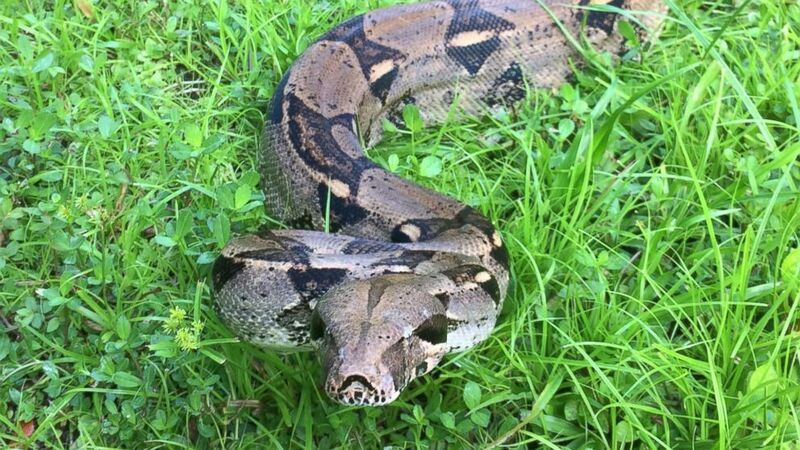 When an officer from the Sarasota County Sheriff's Office Animal Services arrived, the snake was out of sight, and officer said it was against protocol to look for it, van der Herchen said. It was difficult to locate a trapper as well, since the officer told the family she believed it was a rattlesnake, van der Herchen said. His nephew wanted to kill the snake with a spear, but van der Herchen didn't want to go that route, saying it was "animal cruelty." After a few attempts on their own to lure the snake out, the family called 19-year-old Mark Lampart to help retrieve the snake, van der Herchen said. 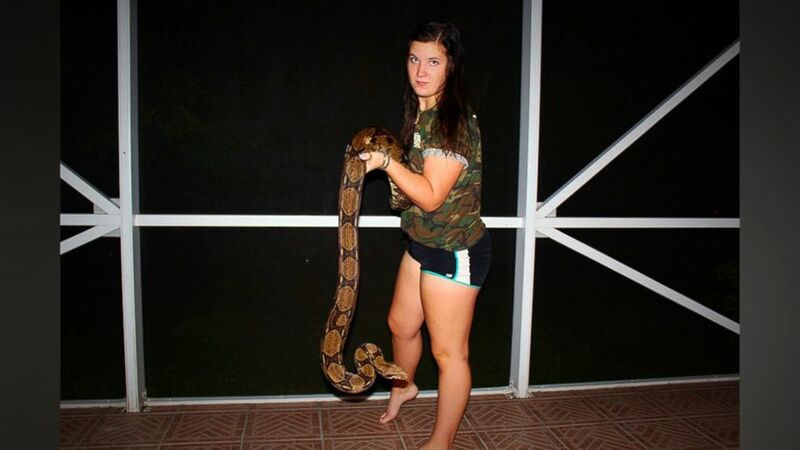 Lampart, a landscaper by day, lives in the Englewood area and traps snake as a hobby alongside his girlfriend, 18-year-old Kyleigh Wofford, he said. On July 24, he and Wofford arrived at the van der Herchen's home and attempted to push the snake out of the small space with a PVC pipe, he told ABC News. But, as soon as the snake saw him, it started "heading in the other direction." "S[he] did not want to come out," he said. "It was a happy snake up there." Lampart then reached his arm out as far as he could and grabbed onto the snake's tail, which he handed to Wofford. The two then pulled it out, he said. Van der Herchen said he was on the other side of the house when he heard "Whoopee!" and "Hurray!" coming from his wife, Linda van der Herchen. The whole ordeal had taken about two and a half hours, Lampart said. Although he said it's obvious the snake hadn't lived there its whole life, Lampart estimates that it had been living there for at least several weeks, based on the waste and shedded snake skins they found. Lampart said he believes the snake, a female about 10 to 15 years old, was someone's pet before it got out. He believes it was feeding on rats and had been "wild" for a while, since it kept trying to bite them. "If it was a captive snake that had just gotten out, it would be very tame," he said. (Courtesy Mark Lampart) Englewood, Florida resident Mark Lampart, 19, and his girlfriend, Kyleigh Wofford, 18, work together to remove snakes in the area. Lampart, who has a passion for snakes and belongs to several reptile groups on Facebook, was able to find a "responsible reptile owner who would be able to take care of it for the rest of its life," he said, urging potential reptile owners to do their research before purchasing a snake as a pet. Lampart and Wofford did not charge van der Herchen for their services, he said, adding that they are available to anyone in the area who has a similar problem at no charge.